Jackie Karuti was born in Nairobi, Kenya, and has in recent years gained positive attention for her experimental, conceptual work using new media. She explores themes of death, sexuality, identity, space and urban culture using installation, video and performance art as well as mixed-media work. Karuti has exhibited and participated in workshops and residencies in Kenya, Nigeria, Senegal, South Africa, Sweden, The Netherlands, Uganda and the USA. She has also collaborated with other artists in various film, photography and academic projects. In September-October she was artist- in- Residence at 32°East in Kampala where among other work and ideas developed, she performed her travelling interactive project, In The Case of Books. STARTjournal.org, talked to her about this performance and her art practice in general. START: Who is Jackie Karuti? Jackie: Jackie Karuti is someone who is constantly trying and failing at things and aims to forever transcend the proverbial box. START: Your performance, In The Case of Books, performed in Nairobi and during your artist residency program at 32° East, Kampala, involves a tour of different libraries. Tell us more about it. Jackie: In The Case of Books is an ongoing project where different people get to travel to different library spaces and engage in the process of dusting and talking about the books they find there. It is designed as a travelling interactive performance. At the core of this project stand the conversations that examine the anatomy of knowledge, place of books, the identity and relevance of libraries and most importantly the myths and rituals amongst the participating persons and institutions. I have performed it twice in Nairobi, in 2013 and 2014. In October 2015 I performed it in Kampala where we visited the Maisha Film Lab, Femrite, The Uganda Society Library, the 32° East art library which is also home to the African Poetry Library and Jstor, a digital library. We eventually culminated the performance at Ife Piankhi’s home library, a performance poet based in Kampala. Inside the Library of 32° East, Kampala. Image by Alex Lyon courtesy of 32° East. START: Why libraries and not any other space to conduct in your performance? Jackie: Libraries, because a lot of them no longer exist or are now in ruins. Yet despite their destruction and decline, the rise of such communal spaces is still very much sought after and the physical book is still very much relevant. Over the years we’ve also seen the loss of archives in libraries all over the world. This is as serious as the loss of memory in a human being and the more time passes, the worse it becomes. Lost archives are irreplaceable, final and societies simply cannot function properly without the collective memory of their archives. Research states that never ever before in the history of mankind has there been a century as destructive to books as the twentieth. Two world wars and numerous totalitarian regimes have exacted their toll while many political upheavals and continuing acts of terrorism continue to purge libraries. It’s simply the thought that one day these hallowed spaces will no longer exist that also scares me. START: How does your tour of libraries evoke the element of public participation and interaction? Jackie: Historically libraries were physical spaces where civilizations kept records of their history, legal documents, religious scrolls and other businesses as well. With rapid developments in technology however that definition has changed and we now have digital and virtual libraries which do not require as much effort as the physical space demanded. This involves communally sitting in silence in these spaces, touching books, being wonderfully assaulted by their smell and simply experiencing that physical human contact that technology has so perfectly done away with. With this performance, the solitary act of reading or visiting a library becomes a shared experience constituting part of a greater ongoing conversation looking at the place, means and space of knowledge within our societies. 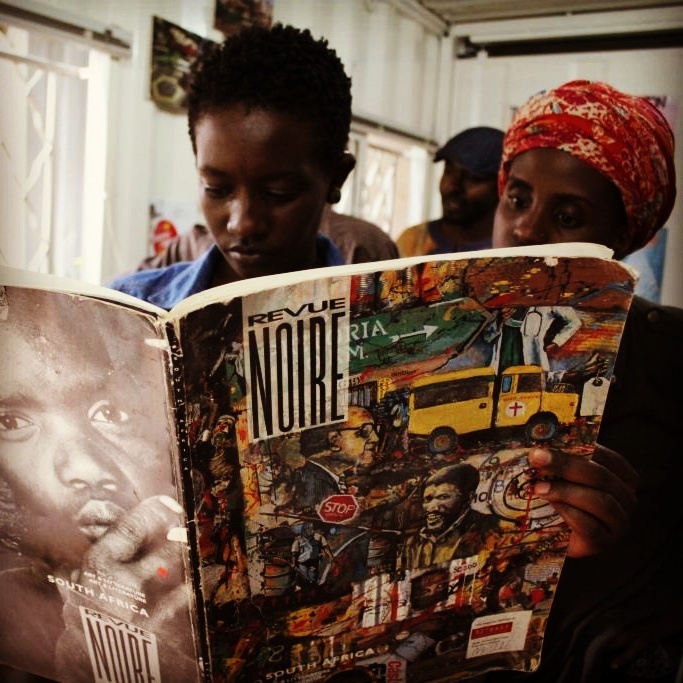 START: As an artist working in African cities like Nairobi, what is the influence of urban culture on your art? Jackie: I would say a lot especially if you look at its relationship with some of the themes I mostly deal with. Identity, gender and sexuality for example are some of the topics that always rile people up, away from religion, politics and football of course. We’re a city made up of relatively young Kenyans. You’ve probably noticed the growing number of light-bulbs hanging over the city because of all the brilliant ideas young people are coming up with. Unfortunately we are also divided especially in terms of social class. This is very problematic. Nairobi is all charm and grey, calm and chaos, beautiful and tragic, jacarandas and plastic… I could go on with these contrasts. These opposing energies are what attracts and repels and in that friction, I make art. START: What is your next major project? Jackie: My next (major) project is about a self-made and self-published little book called EXIT, inspired by the need for self-designed curricula which allows for self-education by deconstructing and disseminating information. Lots of self issues basically. This magazine seeks to address topics of belonging, existence, death, identity and sexuality and serves as an art journal with texts, images, performance instructions and other cool and disturbing things as well. Five one-off editions are already out and there will be one published every month. 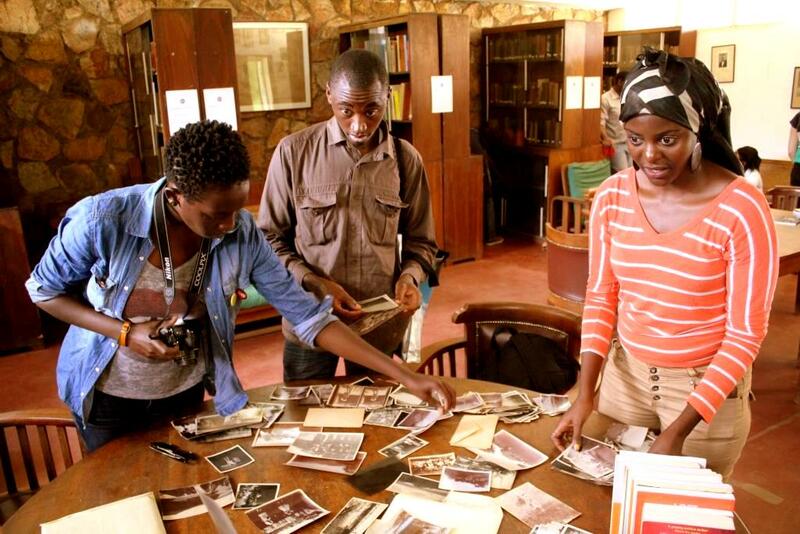 Going through old photographs at The Uganda Society Library. Image by Alex Lyon courtesy of 32° East, Kampala. START: Which spaces (gallery, museum, biennale, fair) would you like to present at? Jackie: Yoh…do we even have enough space for this list? Let’s just say that there are some very amazing art spaces out there I’d want to show my work in but I’m all for shows that give audience to art coming from the African continent and the 1:54 contemporary art fair is one of those I particularly love. START: What is your contribution to the conversation of gender and sexuality in the contemporary arts? Jackie: Plenty. One word: Equality. START: Who are your influences? Jackie: I’m not sure about the word influences. I admire people who try at everything but know where their strength lies, people who find interesting and unique ways to tackle certain issues. I am also drawn to awkward people and characters in real life or as portrayed in films and books. I love the work of Jim Chuchu, William Kentridge, Njideka Akunyili, Murakami (the writer not the artist)… I also think Frida Kahlo & Rotimi Fani-Kayode are boss. They’d be two of those guests at my awesome-dead-people dinner table. START: Which curator would you like to work with?